This is the second fossilized forest that has stunned researchers this month, and it's also the oldest. It's 385 million years old, from the time when the earth's first forests appeared. And it was all buried beneath a quarry in Upstate New York. Scientists had found bits of evidence that these ancient trees existed during a 1920 excavation to build the nearby Gilboa Dam. But after they removed a few fossils, the quarry was filled back in with rock. Geologists from then on mostly relied on pieces preserved in a New York State Museum to study the ancient site. Seven years ago, scientists uncovered a complete tree in what's now called Gilboa Forest, and were ecstatic. Now that they've uncovered the entire forest, they must be jumping out of their Carhartts. "Personally, the chance to walk on that ancient forest floor, and to imagine the plants that I have been studying as fossils for more than 20 years standing alive in the positions marked by their bases, was a career highlight," said Dr. Chris Berry of the Cardiff School of Earth and Ocean Sciences, who led the research. That's him in the photo above with the stump of a Gilboa tree. In 2010, the quarry was once again excavated to work on the dam. Researchers tagged along with the construction company working on the project as well as the New York City Department of Environmental Protection. That's when the scientists spotted the original quarry floor, featuring well-preserved roots and positions of trunk bases. 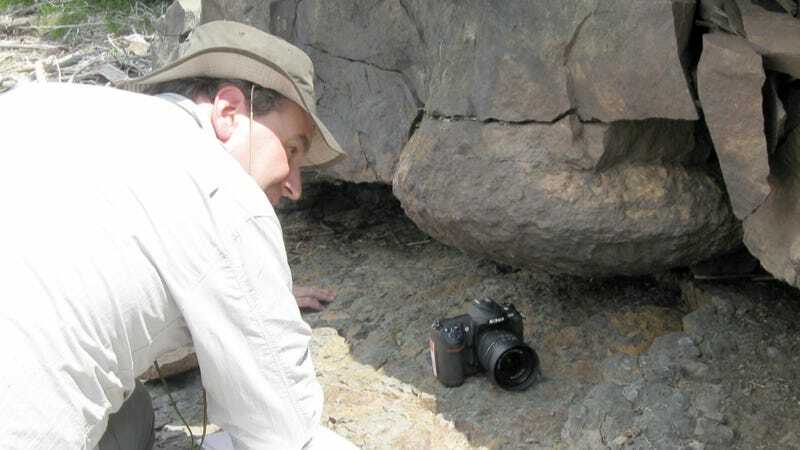 Dr. Berry had 1,300 square meters cleaned off for investigation, and since then he and his colleagues have been mapping the positions of all the plant fossils. The researchers are publishing their findings in the March 1 issue of Nature. They say the bases of the trees are spectacular bowl-shaped depressions up to two meters in diameter and are surrounded by thousands of roots. The trees they belonged to were about 33 feet tall, and likely resembled a palm tree or a tree fern. In the image below, orange markers indicate where trees were located, and Dr. Berry tells me the forest was actually about 200 trees denser but they "ran out of orange things." The details they uncovered showed that this oldest forest was much more ecologically complex than they previously thought. They found woody, six-inch-thick stems lying horizontally from a type of plant (the aneurophytalean progymnosperm) that was previously known to only have upright branches. They also found a large tree-shaped club moss, the type of tree that forms coal seams in young rock across Europe and North America.